Pulitzer Prize-winning journalist David Shribman will be one of the speakers at the "The War on Truth" from 6:30 p.m. to 8:30 p.m. on April 11 in Baker Hall's Giant Eagle Auditorium. The former executive editor of The Pittsburgh Post-Gazette, Shribman steered the paper during its coverage of the Tree of Life Synagogue shooting in October. He now is a Scholar-in-Residence in the Dietrich College of Humanities and Social Sciences at Carnegie Mellon University. The child of two Nixon supporters, Shribman vividly remembers the 1960 presidential race between John F. Kennedy and Richard Nixon, even though he was only 6. By 10, he knew he wanted to be a journalist. At 16, he interned at the Salem Evening News, where he wrote about fatal car accidents and house fires to fill space on the front page. His fascination with politics led him to jobs covering Washington, D.C., with the Buffalo Evening News, the Washington Star, The New York Times, The Wall Street Journal, the Boston Globe, and finally, he moved to Pittsburgh to lead the Post-Gazette. On Oct. 27, 2018, a gunman killed 11 people and injured six in the Tree of Life Synagogue in Pittsburgh's Squirrel Hill neighborhood, only a mile from Carnegie Mellon. Shribman lives several blocks from Tree of Life. "I don't think any one of us was unmoved or unmarked by that day," Shribman said. "It's one of those days where life before that day and life after that day were much, much different." That week, the Post-Gazette ran a headline that garnered national attention featuring the Jewish mourner's prayer. "I felt that if words fail you, then maybe you're thinking in the wrong language," Shribman said. "I felt this was a way to say something for an entire community, 90 percent of whom couldn't read the words. But the message was unmistakable." As a scholar-in-residence, Shribman sees himself as an evangelist for the journalistic arts at CMU. "The newspaper used to be, and still is to a large degree, the element that sets a conversation of a community," he said. "We're in danger of losing that." In a recent interview, Shribman reflected on his newspaper career, his role at CMU and the state of journalism. The full audio interview and a written excerpt follows. This interview has been edited for length and clarity. Listen to the full interview with David Shribman. Q: What will you be doing at CMU? A: I'm an evangelist. It's part evangelism, part pastoral. I'm an evangelist for the journalistic arts. I'm pastoral in that I'll be dealing with some students and some administrators, and faculty as well on some of the topics we'll be discussing. I'll visit some classes. I have some classes of my own already scheduled. I'm just hanging around letting people come into my office and chat or vent or express their delight or confusion. So, it's to be part of this community and to make a contribution to it. Q: How has the role of a newspaper changed in America's elections? A: The newspaper used to be, and still is to a large degree, the element that sets a conversation of a community. We're in danger of losing that. This is not a peculiarly Pittsburgh problem. It's a Pittsburgh problem and a Philadelphia problem and a Boston problem and an Omaha problem and a Denver problem ... It's one of the things that stiches a community together. I think the loss or death of a newspaper would be a tragedy. I was on a paper that went out of business. It was a horrible moment. I dearly pray that we don't have to live through that anywhere in the country again. Q: What specifically drew you to politics, of all kinds of journalism? A: I grew up in Massachusetts, and when John Kennedy was running for president, it marked me indelibly ... I have a brother, who's two years younger than I am ... We used to fight from time to time ... My mother would pull me aside and say ... "look at those nice Kennedy boys. One of them is running for president. And do you know what his brother is doing? He's helping him!" And so, from the very start, the life lessons of mine came from politics. I found the 1960 election, although I was really only 6, something that I remember vividly. To this day the 1960 election is the touchstone of almost all my perspective. Q: What were some of the highlights of your time at the Post-Gazette? A: The highlight of my time was a low moment in the history of the United States and of Pittsburgh, which was the tragic shooting at Tree of Life. No one takes any pleasure ... Indeed, you take only horror from a moment like that. But I'm very proud of how the Post-Gazette responded. Q: What was it like in the newsroom on the day of the Tree of Life shooting? A: It was a moment where people put aside their emotions. It was a moment that my wife sometimes describes as, "Shut up and start typing." Everybody worked hard, and it wasn't until five or eight hours later that we realized that we were covering a story that would affect us each personally. Because in that first five or six hours, we were journalists and not civilians. Q: Can you talk a little bit about The Headline? A: The Headline. In the middle of the night, I guess, on Wednesday, I had this idea. I don't know where it came from ... I called my own rabbi, James A. Gibson of Temple Sinai, and asked him if he would write out for me the first four words of the mourner's Kaddish in Hebrew because we didn't have that in our lexicon, or in our typeface ... People told me not to do it. People said it was half a step too far. But you know, you only live once, and you're only editor of a paper once, and I just felt it was the right thing to do ... I've done commentary, as I said earlier, for 26 years. But I think those four words were the best commentary probably I've ever did. It did resonate. We heard about it from all over the world. Q: You wrote a book 10 years ago called, "I Remember My Teacher, 365 Reminiscences of the Teachers Who Changed Our Lives." What do you want the people you encounter at CMU to remember about you? A: I had great teachers. In the two years or so that I wrote this book, I never ran into someone who couldn't say, couldn't name a teacher who changed his or her life. There's a wonderful phrase that applies to journalism that applies just as well here. Sow a thought in mankind, and if you can sow a thought, or an ambition, or some inspiration in the life of somebody here at Carnegie Mellon, that would be enough. David Shribman teaches a mini-course in journalism ethics. 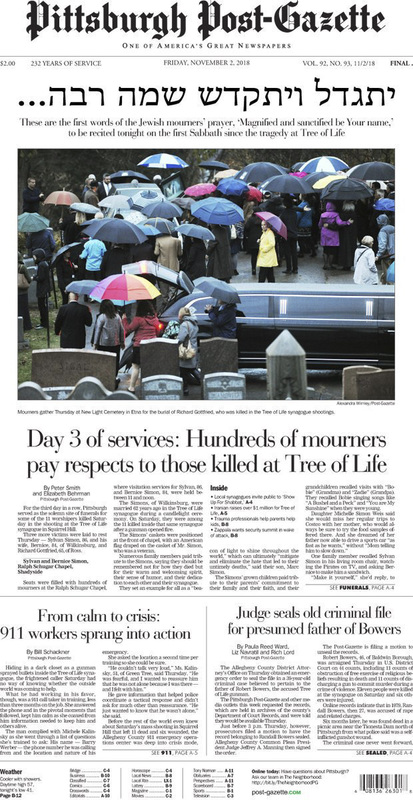 Shribman chose to have The Post-Gazette run the Jewish mourner's prayer as a headline after the Tree of Life shooting.